Technology has never seemed more significant than when it is used to help the disadvantaged and the handicapped. HumanWare’s new DeafBlind Communicator levels the playing field somewhat for the deaf and the blind by enabling them to communicate effectively with others. 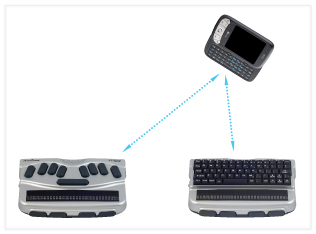 The DeafBlind communicator consists of two portable wireless components connected by Bluetooth. The main component is the DB BrailleNote, a Perkins or QWERTY BrailleNote mPower installed with a special deafblind software. The attendant component consists of the DB-Phone which is a special cell phone equipped with a visual display and a QWERTY keyboard. A conversation can continue back and forth when a blind deaf user keys in a message in the DB BrailleNote. The user-friendly interface, KeySoft, enables most Braille users to use it with minimal training. The message will appear both in spoken and written form. As such, the DbPhone, can be used to communicate with the sighted as well as the hearing and visually impaired. Once the message is received, the recipient keys in a text response in the DBPhone which also coverts the message to Braille to be ‘read’ by the DBC user. And thus, the communication barriers for the deaf and blind are broken down for effective exchanges to take place. The DeafBlind communicator is the most comprehensive communication system to be developed for the deaf and blind. The technology is expected to open doors of opportunities for the blind an deaf to live a normal and productive life like others.